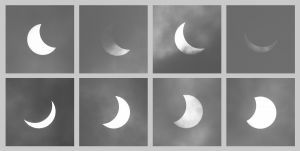 This was the Solar Eclipse viewed from Lede, Belgium. Conditions where not ideal, but if the sun managed to come trough the clouds, it was very good to see, even without special glasses due to the remaining fog. I wish I was in Svalbard where the total eclipse was visible!